For some people, the mention of the name “Tesla” makes them think of the new electric car. For others it rekindles images of the heavy metal band from the late ’80s and early ’90s. For those of us who have actually picked up a book, it sparks memories of the brilliant scientist and inventor Nikola Tesla, whose many inventions and discoveries are still in use today making our lives better and brighter. Now, on the 75th anniversary of his passing, the Serbian-born American is finally getting his due on a new series of coins released to commemorate the genius of Nikola Tesla. These legal-tender coins come in gorgeous Gem Proof condition and were struck in a full ounce of highly-pure 99.9% silver. They not feature not only the image of the scientific pioneer, but one of his greatest inventions—the alternating current (AC) induction motor. Considered one of the Top 10 discoveries of all time, it made its public debut at the 1893 World’s Columbian Exposition in Chicago where it was used to dazzling effect to light the massive world’s fair. The motor is still the main power source for industry and household appliances today! Tesla and his remarkable invention finally take center stage on this beautiful silver proof coin. History buffs, science aficionados and silver stackers alike are sure to appreciate the design and high silver content. This proof is limited to just 3,327 – in honor of room #3327 at the Hotel New Yorker in Manhattan where he lived from 1933-1943. Get one for yourself and several others for the budding scientists in your life. Add them to your cart today! COMMEMORATIVE DESIGN OF ONE OF THE WORLD’S GREATEST INVENTORS – Though he made most of his discoveries after immigrating to the United States in 1884, Nikola Tesla was born in a region of Serbia that is now part of Croatia. The former Serb is commemorated on the obverse of the stunning silver coin released by the prestigious National Bank of Serbia. The coin’s reverse features one of his most famous inventions – the alternating current (AC) induction motor, which today is still the main power for industry and household appliances. It is considered one of the top 10 discoveries of all time. STRUCK IN HIGHLY PURE SILVER – These 2018 Serbia Nikola Tesla Alternating Current Silver Coins were struck in an ounce of highly pure 99.9% silver. 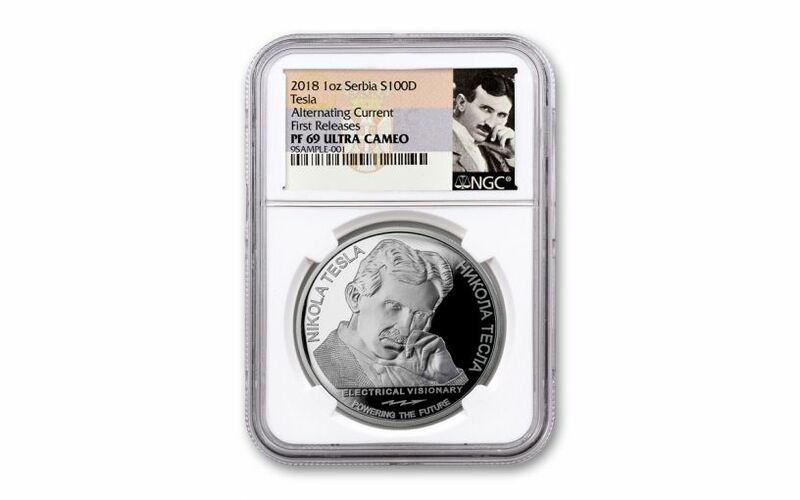 GRADED IN NEAR-PERFECT PROOF CONDITION – Your 2018 Serbia Nikola Tesla Alternating Current One-Ounce Silver Proof has been graded by the Numismatic Guaranty Corporation (NGC) as being in near-perfect Proof-69 Ultra Cameo (PF69UC) condition. 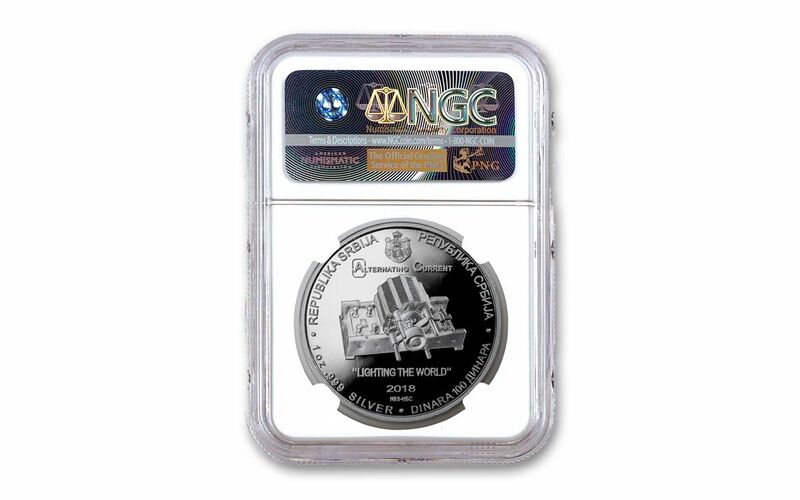 KEY FIRST RELEASES CERTIFICATION – NGC has graded your Tesla Silver Proof to be a First Releases (FR) coin, a designation that means it was received by NGC or an NGC-approved depository within the first 30 days of the its release. It will come sonically sealed in an acrylic coin holder with a special Nikola Tesla label. LIMITED WORLDWIDE MINTAGE – The Serbian Mint has set a maximum worldwide mintage for this coin at just 3,327.